- Snowman with Cocoa Orn. This frozen friend is trying to stay warm on a cold winter s day. With a warm stocking cap, mittens, boots and a warm cup of cocoa, he will surely fend off frost bite! 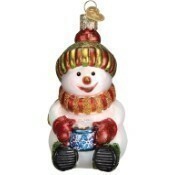 Bring this snowman into your warm, cozy home to liven up your Christmas tree. Size: 3.75"